Language fiesta, LITERATI 2015-16 coloured the entire atmosphere of the school on Saturday, 30 January, 2016. 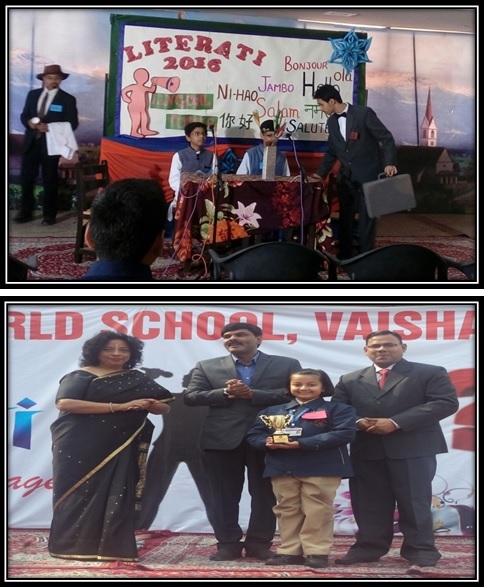 The Interschool Competition that encapsulated 11 events spanning four languages namely, English, Hindi, French and Sanskrit triggered the creativity and imagination of the participants. Nine schools from in and around Vaishali took part in this confluence of languages. The enthusiasm was quite evident on the participants’ faces as they reached the venue fully charged and showcased their talent with full zeal and gusto. The events were judged by a panel of experts. One of the judges, Mr. Pankaj K. Mishr, Professor at St. Stephens’s College, New Delhi shared his valuable experience with the audience. DPS, Indirapuram bagged the Best School Award. The fiesta provided the students with a platform to enhance and exhibit their learning in a functional way.